As you step out from the Warp Room and into Wintersville, the first thing you see is a winding path and falling snow. It floats to the ground so graciously as a soothing and relaxing chilly melody echoes softly through the air. That snowing effect is absolutely marvellous, and it envelopes the stage in a charming blanket of festive feels. It looks way too good visually to even consider that the game is running on PS2. The tone of this stage, the setting, the style…it is all so beautifully constructed. Breathtaking, wonderful. Perhaps the best part about it is the atmosphere, though the stage itself has plenty of other great features—a Japanese festival with taiko drums and stalls, or a small dojo area. A winter wonderland to explore, with a hidden forest out back that you can only explore with hidden monkey unlock codes. By far the most impressive part of the whole dang game, and purely glorious. Well, it doesn’t get too wintry where I am from, and I’ve never seen snow in my life…luckily, video games have given me a chance to cruise through so many different landscapes, including icy and snowy ones, and Majora’s Mask’s Snowhead Mountain is my favorite of them. For one, it’s beautiful—just look at it! On the other hand, I enjoyed not being there. There’s this huge blizzard going on there, causing havoc to its Goron inhabitants. The mechanics played in this setting left a great impression on me; there’s this sense of misery and dread around the place that (unlike a Christmas setting) would accompany a place with horrible weather conditions such as this one. As much as toil and hardship try to keep me out of the mainstream, I can’t help but bathe in the icy glow of Blizzard Wolfang’s stage from Mega Man X6. Considering the game overall has received very few good ratings due to it being a rushed project, the stage itself was well developed. When you think about ice stages or winter stages, you tend to think of one primary thing: ice. And lots of it. Blizzard Wolfang’s stage took a slightly different approach. A lot of the stage focused on avalanches and the use of the stage’s topography to maneuver, as to avoid getting crushed by the chunks of snow falling down. The stage also uses a good concept with ice blocks in a Tetris-type mechanic near the second half of the stage. This continues on to the end of the stage, leading into a vertical segment where lines of ice fall from the sky. 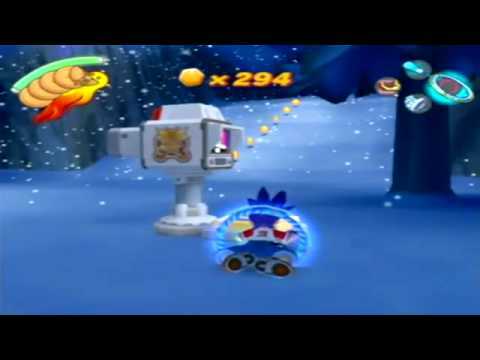 These ice blocks then fill in the row, pushing you farther up towards the boss room. The scenery itself is beautiful; a snowy wonderland which leads to a frozen recon base, inside which you battle Blizzard Wolfang. By far, this is one of my favorite ice-themed stages to date. Just don’t go howling at me later about it (hehe, wolf puns). Aside from the crop of holiday-themed games I found for that one “Flash Flood” column, winter holidays haven’t figured prominently into most of the games I’ve played. I might hit the reload button repeatedly to retry a difficult section of a game, which is reminiscent of the movie Groundhog Day, which centers around a winter holiday, but that’s a bit of a stretch. World Kidney Day is just on the cusp of being in spring, so that one’s no good, and I don’t think Mike Tyson’s Punch-Out!! understands the true meaning of Boxing Day. 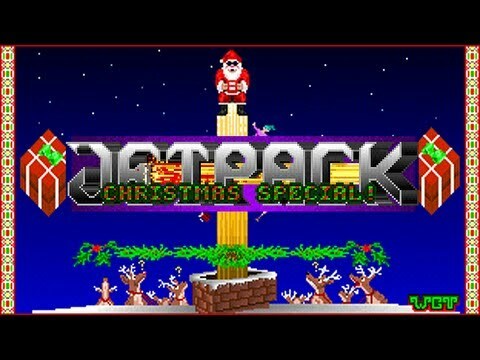 Therefore, I have to go with Jetpack Christmas Special!, a reskinned expansion pack of one of my all-time favorite platformers. Instead of a dude with a jetpack avoiding spear traps and robots in search of treasure, you play as Santa Claus with a jetpack avoiding spear traps and robots in search of presents. It’s completely different from regular Jetpack. And there’s a full compliment of new stages, so yes, it’s a real game. The Ice Country/Ice Palace in Secret of Mana, like most areas, is plagued by a sinister agent of evil. It’s been discussed a few times here on GameCola, but as a friendly reminder: Santa Claus must be taken out. The heroes come across a talking reindeer who pleads for help. 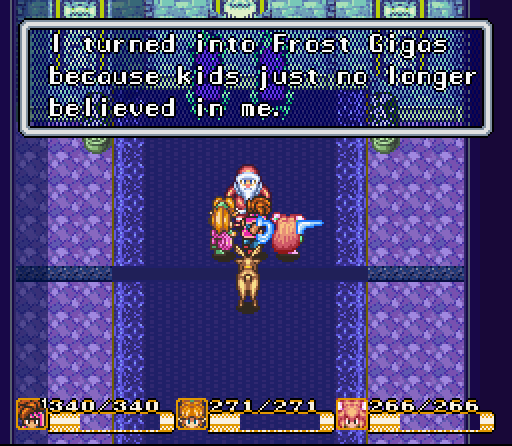 It turns out that Santa has been corrupted by the Mana Seed and must be set free by defeating the Frost Gigas. You’d think that a seed imbued with the power of fire would melt his castle, but apparently he just become a giant ice beast. After freeing Santa, he’s grateful, but doesn’t offer much help other than giving you back the seed. He doesn’t give much of an apology and doesn’t give you any toys or let you ride the reindeer. The battle would have been much cooler if you got to fight him in human form. He claims that kids don’t believe in him anymore. This is what I never understood about Christmas movies. There’s always some jerk parents who don’t have the Christmas spirit and don’t believe in Christmas, and yet the movie takes places in a universe where Santa is real and actually delivers presents. Where do the parents think the presents come from if they deny Santa’s existence? In Santa’s defense, I guess people would be more likely to believe in a terrible monster than a man who’s apparently unwilling to actually deliver presents to children and instead stays in his fortress of solitude. Did the GameCola staff miss one of your holiday favorites, or do you have a question for a future installment? Let us know in the comments!